This happens when Steve Trevor (Chris Pine), acting as a spy for the British, steals the notebook of German scientist Isabel Maru (Elena Anaya), also known as Dr. Poison. Dr. Maru is searching for the ultimate chemical poison to unleash on the fields of World War I to turn the tide for Germany. Steve’s plane crash lands just off the coast of the island, and he is rescued by Diana. His German pursuers find him nonetheless, and battle occurs. Eventually, Diana decides that she must take part in what Steve is claiming is the war to end all wars. Ultimately, Diana is convinced that all of this is happening because Ares is returning, and in hre mind, Ares is most embodied by Dr. Maru’s boss, General Ludendorff (Danny Huston). She convinces Steve to get her to the front, and he enlists the support of Etta Candy (Lucy Davis) and a trio of friends: spy and agent Sameer (Said Taghmaoui), sharpshooter Charlie (Ewen Bremner), and smuggler Chief Napi (Eugene Brave Rock). He is also quietly endorsed by British War Cabinet leader Sir Patrick Morgan (David Thewlis). Battle and badassery ensue. Here’s the thing: Wonder Woman does just about everything right, and that’s a shocking thing for me to say about a movie that was written and produced in part by Zack Snyder. Snyder’s hand can be seen at work in places here, especially in action sequences, but this is very much the production of Patty Jenkins, and it shows. There are a number of things that make the movie work, and all of them needed to be here to make the film work at all. First, and primarily, is Gal Gadot. It would be easy to simply stop with the fact that Gal Gadot is literally one of five most beautiful women on the planet and stop there, but that would be monumentally unfair to her. There are plenty of people, male and female, who are pretty to look at and who can’t formulate a sentence in front of a camera. Gadot manages to make Diana incredibly tough and charmingly naïve, not an easy combination. This is an acrobatic and athletic performance, a true action movie role, and Gadot makes it look natural. But she also brings a great deal of personality to the role, and that seals the deal. Chris Pine deserves a lot of credit as well. It would be easy for Steve Trevor to more or less be a male version of Lois Lane (as he generally was in the comic books, at least in the Golden Age). Trevor as a character needs to be able to stand on his own and complement Diana without either eclipsing her or being buried by her. Pine does this through a progression of slow revelation in the character. Initially, it is him pulling her along a beach out of danger. Soon after, it is him trying to keep her safe in dangerous situations. It concludes with him assisting her on attacking enemy positions, being the support for her offensive. It’s smart, because it feels natural, and it makes sense that a man during World War I would have serious reservations about putting a woman into combat and would take some convincing to get her there. It’s also worth calling out Patty Jenkins here. While there are those moments of slow down/speed up action sequences that Zack Snyder apparently can’t live without, these are used well and intelligently rather than gratuitously, acting more as slow motion to truly show the action than as ways to speed through the battle. It’s Jenkins who is tasked with making all of this work, though, and of keeping the story going between the action sequences. 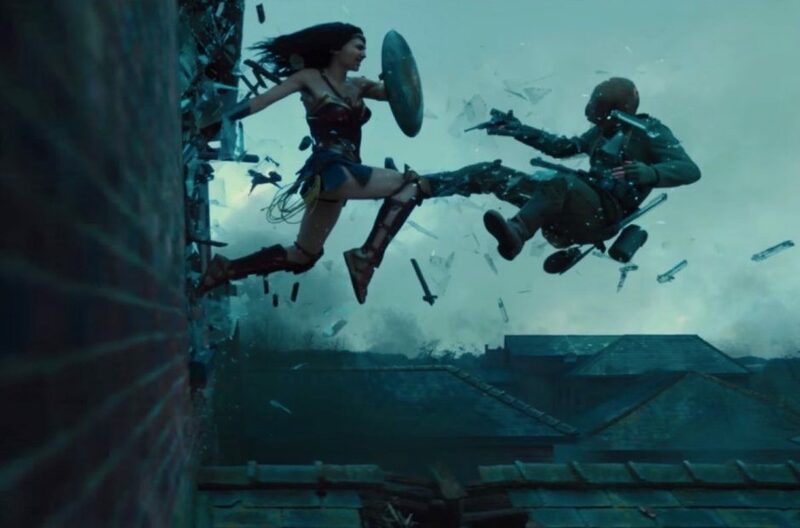 Don’t mistake this—the action sequences are one of the reasons to show up for Wonder Woman, but the movie does not slow down or feel sluggish when there is no action on the screen, and that in large part is the responsibility and success of Jenkins. These are three important points, but there’s a lot more. Intelligent characterizations of minor characters, for instance. It’s true that Ludendorff is perhaps undefined and one-dimensional, and the same can kind of be said about Isabel Maru, but I’m kind of okay with that. This is, ultimately, an origin story, and the focus is thus necessarily on Diana. This doesn’t feel like an origin story, though. It dispenses with backstory quickly and efficiently, giving us just enough to define our characters and get us into the story. There’s a lot to like here. In fact, my only real complaint is one that I would have in any event—I don’t like the name of the character. “Wonder Woman” just doesn’t work for me as a superhero name, something that is true for me with a decent percentage of DC heroes (“Aquaman” strikes me as a particularly dippy name). That’s no one’s fault, and is hardly a reason to avoid the film…especially because I’m not sure Diana is actually ever called that in the course of the film. I haven’t yet seen Justice League and I’m not terribly interested in it, but if I am, it’s specifically to see more of this incarnation of Diana. I’m curious to see where this ends up come Oscar nominations in about 10 days. It’s a genre typically ignored for the big awards, but after the scandals of last year, it may be impossible to overlook. Why to watch Wonder Woman: This is the template for DC superhero movies…or it should be. Why not to watch: No good reason—it’s a solid winner. I don't like superhero movies. Like, I really don't like them. It is a fundamental thing with the idea of a superhero that just does not appeal to me. But with Wonder Woman I was able to get past that and that is remarkable in its own right. It is everthing that is happening outside the action sequences that makes it work and as you say, that is primarily down to the director and good casting. When Wonder Woman came out it was a huge thing both here in Israel and back home in Denmark. The stories were almost identical, just replace the names. In Israel it was Gal Gadot, in Denmark it was Connie Nielsen. With the possible exception of Diana being truly superhuman, Wonder Woman is really just an action movie. Maybe that's the way to look at it. I really liked "Wonder Woman" and thought that Patty Jenkins had done much to rehabilitate the DC brand. My only quibble was with the boilerplate "boss battle" at the end. Aside from that—wunderbar! Everything you wrote about Gadot, Pine, and Jenkins was spot-on. Yeah, I can see that. I'm not honestly sure how you get away from the "boss battle" in an action movie these days, though. It can be done, but it's such a huge risk for an audience that is expecting that giant finale. In a film that's already taking a lot of risks, it might have been too much to take one more. That last battle was my issue with the film, too. I understand that given the genre it's going to be there. I just don't like how this one was done. It was way too long and drawn out with a lot of iffy cgi. Everything before that was fantastic, though. I'm honestly willing to overlook it because the genre does call for it. When we have a movie taking risk (female superhero protagonist) after risk (woman director) after risk (World War I setting), some familiarity--even cliched familiarity--is to be expected. Now...should the big boss battle appear in the sequel, I'll sign on with your position fully. The first inkling that they had a good chance of being on the right track was when I heard it was set during World War I! I thought, somebody is willing to take risks so maybe this won't be the SH*T SHOW that some of the others were. And I really loved it! I saw it twice at the theater. It's not quite my favorite movie of the year as I loved Atomic Blonde and Professor Marston and the Wonder Women (She's her own competition!) a bit more, but it's in the top three! Is Train to Busan a 2017 film or a 2016 film? That's in the running too. I think it's fair to suspect that this was going to be more of the same when it came to DC superhero films. I liked both Batman Begins and The Dark Knight, but have otherwise been unimpressed. Wonder Woman did it right, and that was fun to see--DC needed this. Train to Busan is 2016, as far as I know. Wonder Woman was a great film for all the reasons you've mentioned, especially Gal Gadot. What a fantastic performance. She was easily the best thing about the execrable Batman v. Superman and she takes this opportunity and just nails it. And your appreciation of Chris Pine is also dead on. His story arc and the way he accepts Diana, more and more trusting her, is really nicely done. You didn't mention it but I'm sure it was in your thoughts when you referred to the action scenes. The moment when Diana takes off the ridiculous fur coat, climbs a ladder and emerges into No Mans Land fully revealed in her Wonder Woman outfit for the first time is not only one of the greatest superhero moments in film, on par with Chris Reeves first appearance as Superman, but it's one of the best scenes in a movie this year. If only the rest of the DCU movies were this good. As far as Justice League, I enjoyed it because, mostly due to Wonder Woman, the characters are allowed to HAVE FUN. Gal Gadot is once again glorious, of course. Yeah, that reveal is pretty damn great. That's the "superhero moment," the great shot that makes everyone in the audience (and everyone in the film) aware that we are in the presence of a fully-realized hero. It's a true "wow" moment--we've had hints leading up to it, but in that moment, she is fully realized as the hero we've come to see. What I really loved about this more than anything is that it's evidence of what I and many others have said all along. Good stories are what sells movies. While the men's rights assholes who recut The Last Jedi to remove all of the women will hate this on general principles, the majority of people don't care about male or female protagonists. We want good stories, and we'll take them regardless of what those heroes look like. And from what it looks like, Black Panther is going to make the same point soon enough. Yep. That's also what I loved about Coco and Moana. Great stories with great characters. If you can't see past the fact that they're not white, male stories, then you're an idiot. I haven't seen Coco yet, but I assume it will be nommed on Tuesday, so it will be on the list. I liked Moana quite a bit, and loved Kubo and the Two Strings, which certainly falls into the same non-white category. Stories are stories, and more and more people in the industry are starting to see that. And I'm jazzed about Black Panther, who has been my favorite Avengers character since the early '90s.